This compilation of colorful and eye-catching printable subtraction tables and charts is perfect for introducing the concept of subtraction to little ones.This set of handy charts is helpful for children to quickly find the difference and solve the subtraction sentences. 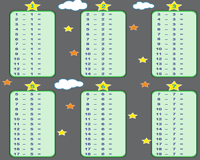 Use the display charts in the classroom or at home to keep young ones visually engaged. The charts will also be a great addition to student binders. A number of blank charts are at your disposal for ample practice on subtraction. 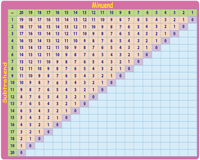 This set of teaching resources comprises of display and blank charts with minuends and subtrahends ranging from 1 to 10. Print the display chart and pin it up in the classroom. 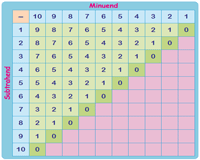 Use the blank chart to assess subtraction skills of children. Find the difference between a range of numbers from 1 to 20 with these colorful subtraction charts, designed exclusively for children to grasp the concept of subtraction. Download the display and blank charts that are available in PDF format. 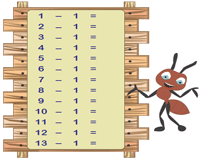 This array of simple display charts serves as a perfect visual aid for introducing young ones to subtraction. The numbers to be subtracted will remain constant in each of these charts and will range from 1 to 12. Employ these colorful subtraction tables and engage your child to solve each subtraction sentence in which subtrahends remain constant and minuends vary from 1 to 24. 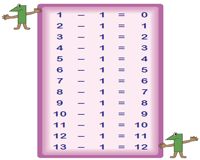 This set of subtraction tables from 1 to 12 printed on a single page serves as a handy daily-recall-chart suitable for the classroom setting. 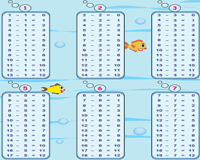 Keep the young ones thoroughly engaged with our 1 to 12 subtraction tables printed on a single page. Download these blank charts that are available in both color and monochrome for a delightful learning experience!